If I had to guess, I’d say there are few people who leave Amigos without taking with them a funny memory of, or strong fondness for, Domingo. 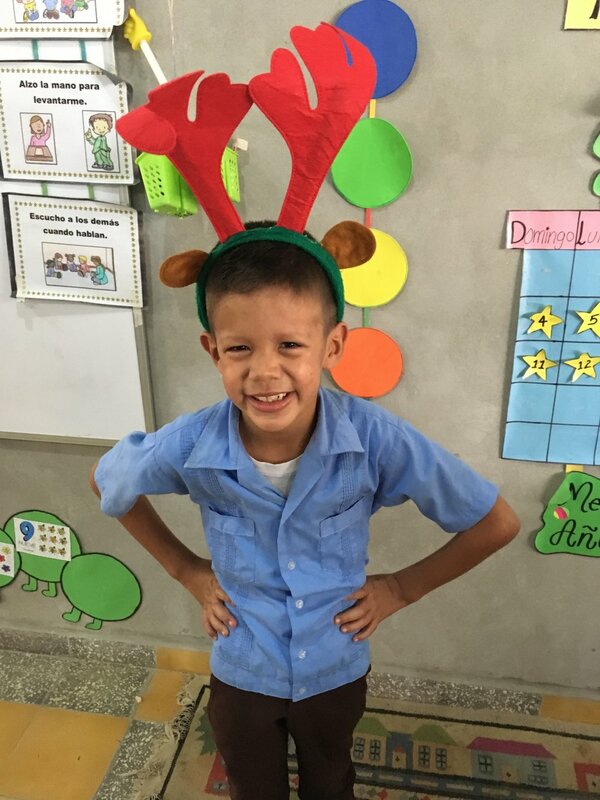 * Standing at just under 5 feet tall, Domingo is a thin child, with more legs than he can yet figure out how to coordinate and a huge personality that more than makes up for what he lacks in weight. My first interaction with Domingo resembled what I assume many others experience when first meeting him: a conversation, often about markers or the police, that begins sans any semblance of introductions; an attempt to use your phone or watch that is quickly followed by another adult reminding Domingo that he has to return said object; and the feeling that there’s something you definitely won’t forget about this kid. Whatever it is, Domingo is certainly one of 135 of our favorite people! He is energetic, curious, intelligent, and caring. Recently at school, one of his classmates got upset before lunch and refused to leave the classroom. Although Domingo had already been dismissed to go eat, he wandered back into the classroom, asking, “¿Qué le pasó a Kasandra*? ¿Por qué está triste?” (What happened to Kasandra? Why is she sad?) Domingo insisted on staying in the classroom until Kasandra was ready to go, alternating between approaching her and saying, “Vamos Kasandra” (Let’s go Kasandra) and drawing “caritas tristes” (sad faces) on the board to the many parties he deemed guilty for making Kasandra sad. Domingo and one of the older boys he lives with. There are many incredible things about Domingo – the indiscriminate and unassuming way he brings joy to the people around him, his ability to make people laugh, the way he makes any new volunteer, visitor, ‘padrino,’ ‘madrina,’ teacher, or employee feel immediately welcomed – but the way he is growing is easily one of the most noteworthy things about him. When Domingo first got to Amigos, he tired easily at the shortest of walks but now can be seen moving all around the ‘hogar,’ walking around with his ‘padrinos,’ helping a volunteer pass out medicine, or even chasing cats and other children as he shouts and laughs. Additionally, Domingo learned how to write his name earlier this year. Now, whenever there is a marker or pen and paper around, Domingo starts writing. He writes out his name and then scribbles out a random assortment of other letters in the alphabet that he is learning. He has even begun asking people around him to spell out names and words for him so that he can practice more. Whatever Domingo does, he is sure to be doing it with energy and life, not just laughing himself, but making all those around him laugh as well. Thank you Domingo for the light and joy that you bring to our family! Domingo enjoying 'merienda' (snack) at Visitor's Day in March of 2016. Domingo showing off his writing skills! Celebrating the 20th Anniversary of Amigos de Jesús! Domingo, in the blue striped shirt in the front, with several of his classmates and teachers at Día del Niño (Children's Day) in 2016. 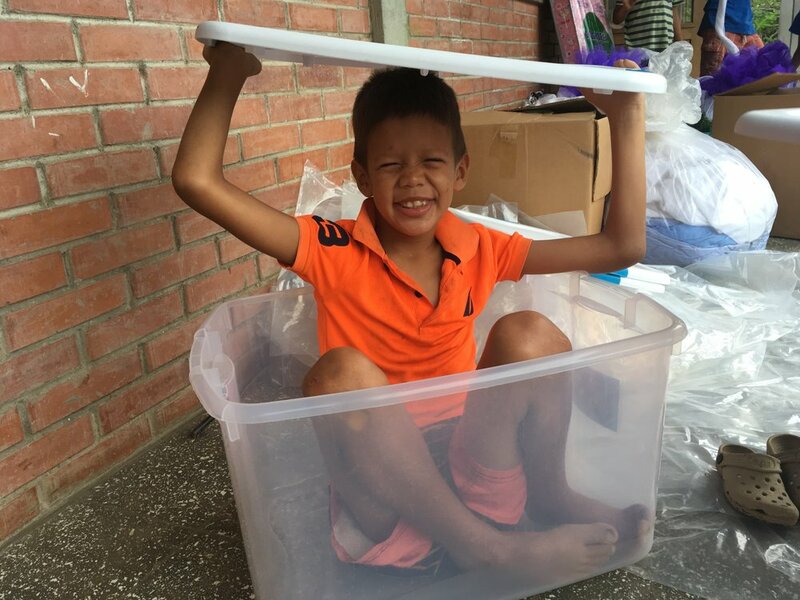 In September of 2016, Domingo visited the U.S. during the yearly trip that Wilson (Co-Director of Operations), Suyapa (Director of Human Resources and our on-site lawyer), and several of our children make. Check out this video of Domingo rocking out on stage during the Broadway Sings event!